1. Receipts from cash costumers, P16, $420. 2. Received bill for gasoline used by the service vehicle during the month, P3, $270. As we are receiving money (receipts), it obviously affects cash/bank. So that is the one account. The other is sales (or services rendered if that is what the business does), as it is cash customers and we are recording the sale now. If it were credit customers who are now paying us, the other account would be debtors/receivables. 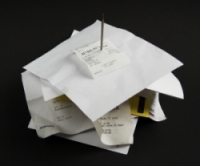 Usually when you receive a bill it means you have a creditor/payable and still need to pay the bill. In this case the expense is gasoline, which you pay straight away (you never have a gasoline company as a creditor). So all we are doing here is recording a cash expense, and the two accounts are cash/bank and the expense account of gasoline. For more information on which accounts are affected in different circumstances see the lessons on basic accounting transactions.